Welcome to the KM Indicator Library! We offer comprehensive guidance—including a unique logic model and common indicators in a searchable database—for professionals whose health and development work involves managing and sharing knowledge . Monitoring the reach of your knowledge products? Integrating adaptive practice in your performance management plan? Evaluating the quality of your partnerships? This site is endorsed by the Global Health Knowledge Collaborative, a forum for KM professionals working in global health and development to collaborate, innovate, and exchange ideas. 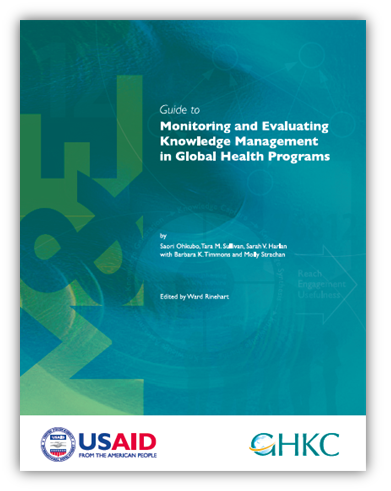 This site offers adapted and updated content and indicators from the 2013 Guide to Monitoring and Evaluating Knowledge Management in Global Health Programs as well as new content and indicators on emerging KM themes.